I guess this would be helpful in spreading awareness for lesser-known glitches, so feel free to post glitches you saw in any version of SSF, even the Wii and 3DS ones. Edit: I'm hoping we could get this stickied. Edit #2: Please make sure to state the version of SSF you're using when posting a new glitch, so we won't have to ask later. In the 3ds version, the bounce challenges can lock your jump and force you to restart the level if you jump onto another platform in a certain way. Well, I found this awesome glitch in Tower of Time! You get to look at characters up-close. You know that small area right before you return a gear to the Tower? Do not go to the Tower, instead go towards the way facing the camera and go to the left corner. Keep on walking and then you should eventually go through the invisible wall. Walk forward and you'll get access to the Central Plaza on the main island, but at a lower camera angle, one that you can get close too. All characters can do this except the Giants, because of their size, you can however pay as the Giants after the give has been preformed. During a playthrough of Tower Of Time, I was playing as Night Shift right before the end (literally about to place the final gear) when somehow Flynn's balloon dropped me in front of the invisible wall. I couldn't get back in, and was forced to start the level from the checkpoint again. The glitch in bold happened to me. In fact, that's the glitch that the link I provided was about. What version were you playing? I was playing on the Wii U version. That glitch can also happen with a green screen. I've had this one twice: I've gotten stuck behind an invisible wall in the Undead Gate in Cascade Glade. With Grim Creeper, both times. In the same spot. It actually happened in the run I recently started. Thankfully, that was easily fixed by putting a Giant on the Portal, since they're larger they'll spawn back to a normal spot. It's kind of funny. Wish I could figure out how to replicate it, but I don't really know how I did it. The first time I played Motleyville, after opening one of the chests, for some reason my Skylander was falling into a black void. It forced me to restart the level. I have no idea what caused this glitch and it hasn't happened again. I've had the Angry Angry Plants glitch once, too. 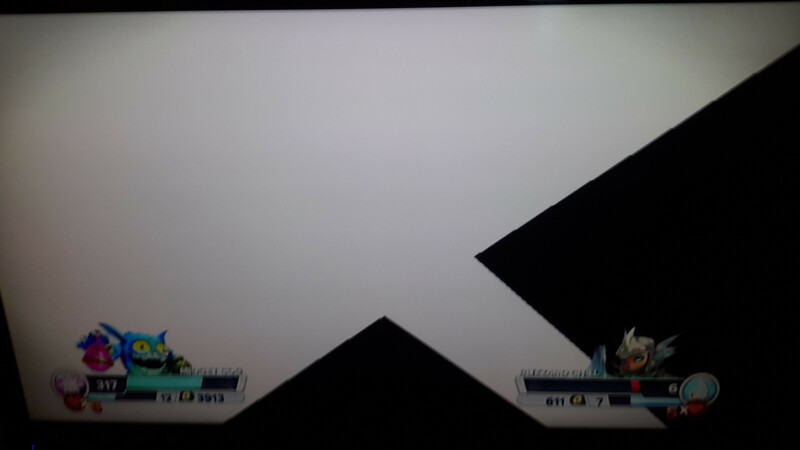 Here are some of the glitches I've found on the Wii. At the title screen, if Player 2 presses A to continue to the main menu instead of Player 1, the game will get mixed up and think the P2 remote is P1, and vice versa. So when it tells Player 1 to put a character on the portal, it's actually Player 2 that needs to choose and control a character. Reconnecting the remotes so the positions are switched doesn't work. The only way to fix the glitch is to reset the game and have Player 1 press A to start instead. I'd be interested to hear if this glitch is on other systems. Occasionally, if a second player leaves the game, the Portal Master Rank will randomly go up by 2. To fix it, you have to go back to the main menu and start your save file again. This glitch happened in Iron Jaw Gulch. In the room with the Life Gate, when I had to beat some enemies to open the Battle Gate, one of the Evilized Kangarats I had to kill was stuck infinitely spinning in mid-air. I was Legendary Stealth Elf, and she couldn't get anywhere near it. I should have tried using a different character, but I hadn't thought of that at the moment I had to restart the level. I think there's a few more, although I don't feel like typing them right now, so. Oh, and if you're questioning the name "Midget Cog"... IT WAS A FRIEND'S IDEA. That reminds me, if your at Cascade Glade's undead zone and have killed all the enemies, if your careful enough, you can box to the front of the throne then jump on to the box, then you can jump onto the Throne. If you try to get behind the Throne, you will fall into the Fire Zone. You can get out of it if you have a fire Skylander and if you do, you will see the first area of the level in a different camera angle. Speaking of different camera angles, I forgot! I've had a glitch where Woodburrow was stuck at a different camera angle. It's happened twice now. If I went to a different area the camera changed but the glitchy camera in the main area didn't. I think I fixed it by going into the Cheiftess' hollow but the second time that didn't work and it stayed broken. I think both times I was using Night Shift. I think the glitch has something to do with one of the training dummies at the top of the yard as it happened after I attacked them. I got this as well! 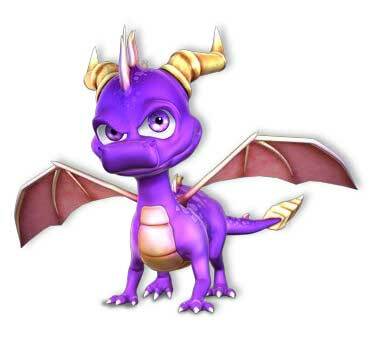 I can't remember who I was playing as, I think Night Shift though, but then I switched to L-Spyro. Cool Glitch either way. I wish it would happen to all levels, that way it'd be fun to replay them! Ouch. Do you'll think they'll patch that somehow? How many hours do you think causes the lockup? How often did that happen, anyway? The announcer forgets to say "Night" when Night Shift wins a battle in PVP. @ItalianGamer I doubt patching the 3DS game is high on their priority list, considering they haven't patched any of the console games, and n-Space is probably busy developing the 3DS version of Sky4 anyway. So I don't think so. Not sure how long you have to play for it to happen. Kinda wish you could adjust the camera in the game(at least switch it to a few different preset angles), because the camera glitch actually makes the game look really neat. Heh. Just their way of bypassing tech limitations I guess. Also, sometimes (on console) Sprocket gets stuck building her turret forever. It hasn't happened to me on Story mode yet, as far as I recall, but it's happened to me a couple of times on battle mode(on Rampart Ruins and Frozen Outpost). Also on the 3DS version: Series 2 (Blizzard) Chill has a glitch that renders her Wow Pow useless. It works fine in the hub world- where it's essentially useless anyway, go figure- but if you try to use it in a level Chill will be stuck summoning ice blocks forever. Doesn't matter if you get hit or anything. She'll just be in the same stance and cannot be moved. Playing Tower of Time I managed to be outside the "raising" ring platform when it closed and went up. I was left standing on the edge somehow. If I fell I re-appeared back on that ledge and the platform was gone. No way to get up again. I had to quit and re-start. Actually, N-Space is not working on the 4th Skylanders 3DS game. Well, according to Sboy13's glitches on the Wii version, I could probably conclude that SSF Wii is about as much of a glitchfest as Sonic '06. Glitches to me are more interesting side effects uncovered while playing the game. The Wii version doesn't have glitches. It has BUGS. Functionality impacting bugs. Hmm? Do you have a source for that? Well, I consider bugs and glitches to be similar to each other (a.k.a. programming errors in a piece of software), but I bet Sonic '06 had its fair share of bugs, I guess. SSF Wii probably has about as many glitches/bugs as Sonic '06, but I'm doubtful as i've never played either Sonic '06 or SSF Wii. Samething happend to me. I was Dark Blast Zone, though. That happened to you on the same level and mode? It wasn't time attack, just regular mode, but yes same level. Also happened in Tower of Time during the first battle against Cluck. I remember falling through the board boundary into the game "netherworld" on the first level in one of those bumble bee rooms. Haven't duplicated it since. Details beneath were raw and basic as you'd expect. In this case I had to reset. I've also been stuck in some game areas, but here the game accounts for it by "resetting" the character into a space where you can move. I think this was kinda a "catch all" coding technique where they test movement and if they decide you can't they "fix it" in real time. Australians with the PS4 version cannot get online. All those who say the Wii is glitch-ridden - I have never suffered a glitch in it. When the patch was released for most consoles, I think they may have added an update to all Wii discs produced after, and I didn't buy my Wii version until a week before Christmas, so therefore missed most glitches. The funny thing with the Wii's glitches are that they do not effect everyone. Some people can barely play while others never have the fist glitch. It seems to be hardware based with a strong consideration of how much memory your system has available to it, though to be honest we don't play our Wii's version enough (I picked up someone's dark force starter and it happened to be for the Wii) so my experiences with it should not be considered normal usage. Have an extra boomer and punch pop fizz that are opened and a darklight crypt that is still sealed for trade. Honestly, the glitches I've came across in this game haven't been too major, but if you're referring to the freezing, well then I also got mine before Christmas, around December 12, so if it's true that a patched version of the game was released, then I must not have gotten one. You are right that it seems to be hit or miss with the Wii version. What's funny is that for the first couple of months I played the game I never had a freeze, now my game seems to be freezing periodically. Although SSA actually froze once too when I played it recently, so maybe there's something up with my Wii. It is 5 years old and has been modded, so. Well, you're probably very lucky to get a non-glitchy/buggy copy of SSF Wii. I know of a cousin that might have bought SSF for the Wii, and if that's the case and they suffer major glitches in SSF Wii, I'll probably have to tell them to get the Xbox 360 version (Since I know they have one.) and return the Wii version to the store they got it in. I got the Wii U version. It sounds like that little "U" makes a world of difference for SSF, doesn't it? The age doesn't make a difference - mine is about 5 years old too. As for the mods - mine is soft-modded, but I have no hardware mods. Does anyone have a rough date for when most consoles got a patch? Maybe we can work out if the Wii ever recieved updated game discs. I was playing Fantasm Forest (PS3), and when I got to the bit where you find the first rocket shooter trolls, the game went REALLY laggy and after a few seconds, the whole screen went green. I was using Blizzard Chill, I took her off the portal to see if anything happened, but nothing. I had to restart my PS3. Freezes have been reported on most platforms...Wii suffered from a very specific bug depending on Wii version, hardware and available memory. I've had at least two dozen Freezes on PS3 from Dec-Feb...funny though I haven't seen many lately (however not playing story much anymore). I think it was around Halloween when Activision claimed that they pushed out a server side hotfix to resolve the issue. I have tried to see if this is actually true, but I still had freezing. The game actually hasn't froze the last few times I've played it, but don't know if it's either just luck or if it was actually fixed. If it was around Halloween that they gave everything but the Wii a patch, it is possible that some discs before Christmas had a patch included, but not all retailers had them. Oops, you know what, I misunderstood your last message. I thought when you meant "most consoles" you meant most WII consoles... the "server side hotfix" that I was referring to was for the Wii. Not sure about patches on other consoles. Still, you could be right about that. Mine came from Amazon, so chances are they may not have sent me an updated version, if there actually are ones. Well, the fading red screen glitch on the "Angry Angry Plants" challenge happened to me again, but this time as my recently obtained . There seems to be a glitch where for some reason, the characters start to move slower when in front of the entrance to the Underhollow in Woodburrow, but when they exit that space they move at normal speed again. I'm sure all other people who have beat the game on Wii know about the glitch where the Spark Lock chest in the Great Hollow area of Woodburrow is impossible to open. It tells you to press -, but nothing happens when you do so. It is still possible to complete the accolades for Spark Locks and collectibles in Woodburrow without the chest, but still, it's a bit annoying to have a chest sitting there right in that room that doesn't even work. In Twisty Tunnels, the area with the quicksand holes and the mini Power Pod is somewhat glitched. If you're in 2-player and try to get near the power pod, for some reason the tether becomes extremely small and you're stuck together in that tiny area and have to struggle for a few seconds to get out. Entering the Power Pod itself doesn't work how it should either, as instead of just walking up to it and pressing -, there seems to be some sort of invisible wall in front of the power pod that prevents you getting close enough to press the button, so you actually have to jump near the wall and when you're in mid-air, you can press the - button to activate the pod, but you have to time it right... wow, that was a mouthful for such a small thing. I am on the Wii U and every time I use Series 2 Prism Break I can only use his Wow Pow a few times before he just does an infinite beam and you can only make hit stop by jumping. As soon as you press the primary attack he infinite beams again and his Wow Pow is no longer useable. I can recreate it every time and the only fix seems to be restarting or changing locations. Kinda cool kinda weird. I collect way more than just Skylanders and other video games, check it out. Here's another glitch I just encountered on my Wii U version: when I was doing score mode on Kaos' Fortress, a little while after I did a bounce zone with , the bounce zone music was playing in the main level. I tried doing a climb zone with , but that didn't help much, as the bounce zone music still played even after doing the climb zone and getting the gems. Not sure why it happens, though. Update: After I talked to Softpaw at one point after the glitch above occurred, the music went silent after my character put on the sheep disguise. very odd. Update #2: The music returned to normal after i got sent into the "Super Duper Guardpost" area. Update #3: When I was in the same level and mode as described above, I inexplicably fell to the goo pit below the "Super Duper Guardpost" area, and for some reason, the game wouldn't teleport me back to the floor I was on, and I'm probably going to have to restart the level. Update #4: I shouldn't worry about disc scratches, because when I looked at my Wii U SSF disc, it was in pristine condition, so any glitches I have aren't likely to be due to a scratched disc. Me and my sister where playing on the Wii version (in Tower of Time level) my sister was playing Flashwing and she accidentally fell off a cliff. I continued walking forward 'cause I knew she would be placed back on the ground. A enemy introduction video started and in the middle of it Flashwing popped out of no where and was just standing there. She was smaller then the enemies and I think one enemy went through her. I have captured a few other glitches on ps4 but I'll have to go digging through my capture library to find them. One major glitch with the ps4 that people have been telling me about (I manage a trophy guide thread on another forum) that they have been unable to get the 'online' trophy in Woodburrow. Every time they walk over to the sign post the trophy never pops up, rendering achieving the platinum trophy impossible. One other thing I've noticed, and I'm not sure if it is glitch-related, but whenever I'm using the Vita as a second controller (for PS4), the connection (wireless, using wi-fi so not through the PS4) is veryyyy weak. Frequently I've had to look at my tv screen to see what I'm doing, because the screen on the Vita becomes pixelated and blocky. I can't understand this, because we've got a fast connect, yet it still tells me the connection is very slow. Anyway, yeah. 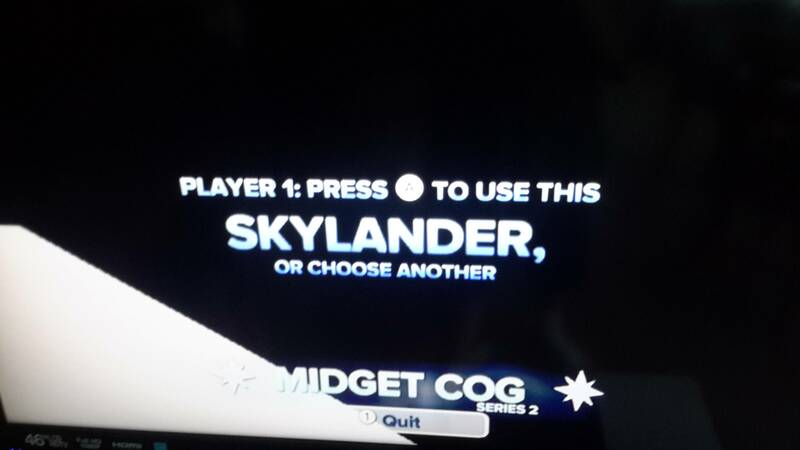 I'll stop by here again if I discover any more errors in Skylanders for PS4. I've stopped using my ps3 version since I got the game for next gen.